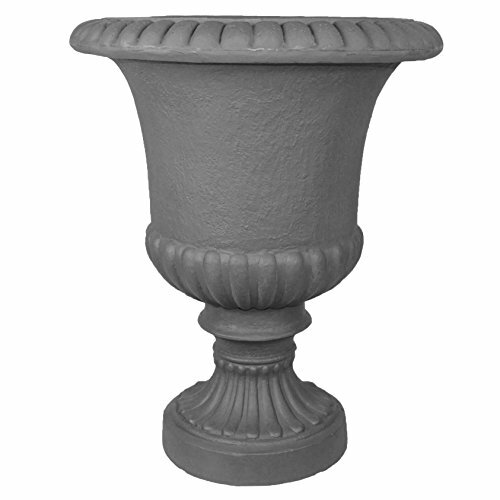 This Tusco high-quality urn planter features the classic look of clay and natural stone without the expense, cracking and heavy weight. Perfect for the home, garden, patio or balcony, this classic design with elegant silhouette provides an elegant and traditional touch to your indoor or outdoor space. Tusco planters are constructed of rotation-molded plastic to achieve a natural look that is durable (unbreakable), lightweight, weather resistant and UV protected. Includes drain plugs, undrilled. Tusco also makes matching saucers (sold separately). This slate-colored urn measures 27-Inch tall and 22-Inch in outside diameter. 10-year manufacturer warranty. Proudly made in the USA.